It’s taken a few games, but Michigan is starting to remember how to win. The team that took the court against Xavier and UConn looked scared of the big moment. They were pushed around, out-hustled and struggled to hit important shots. After a season that saw almost as many losses as the previous two combined, who can blame them? Michigan’s veterans that played down the stretch last year aren’t 100% and the ones that are healthy were sitting on the bench watching those losses. The Wolverines hadn’t figured out how those pieces fit together in early November, but have a much better idea now. The Wolverines still might not have accomplished anything out of the ordinary with wins over Texas in the Bahamas and NC State in Raleigh, but those are nice solid non-conference victories for a team carving out a new identity that looked borderline shell-shocked last Wednesday in the Bahamas. Michigan earned its first road win since last January at Rutgers and appears to have found direction and confidence with one more major non-conference test to go next week at SMU. There’s nothing wrong with winning ugly from time-to-time. Michigan’s offense scored a pedestrian 1.04 points per possession on the night, but its defense held NC State to just .93 points per trip (its second best defensive game against a Division I team this season). Michigan’s first half defensive effort was tremendous as it only allowed NC State to attempt 3 free throws and rebound 15% of its misses in the first 20 minutes. Those numbers both regressed toward the mean in the second half as the Wolfpack attempted 21 second free throws and rebounded 43% of their misses, allowing them to cut the lead to four points late. Despite the fact that Derrick Walton is Michigan’s shortest player, his absence can’t be overlooked on the defensive glass (where he led Michigan entering today’s game). The Wolverine defense did a lot of things well including holding the bigger and stronger NC State to just 43% shooting at the rim and a 36 effective field goal percentage. 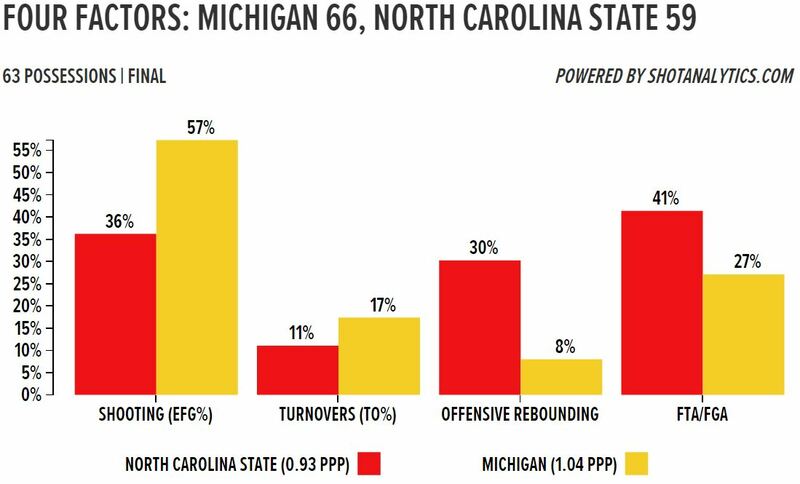 NC State isn’t a good shooting team, but Michigan did a good job of forcing it into low percentage shots. In perhaps the most impressive, and telling, statistic of the night the Wolverines outscored the Wolfpack 28-18 in the paint. Offensively, Michigan was streaky but deadly. The Wolverines missed 7 of their first 9 shots to open the game and 5 in a row midway through the second half, but those two cold streaks accounted for half of the team’s misses. Michigan turned the ball over a bit too often (17% of possessions) and didn’t get anything on the offensive glass, but it is going to win most games where it shoots 61% on twos and 35% on threes. The 2-point shooting was a great sign for the second straight game as Michigan made 12-of-18 attempts at the rim and had the pick-and-roll game clicking (Doyle and Wagner combined for 14 points and 6 rebounds on 11 shots). Michigan couldn’t afford to drop this game. Not with two losses already on its resume and not with a trip to Dallas on the docket next week. Walton’s injury is a major concern, even if Beilein says that it’s not expected to be a long-term injury going forward, but if Michigan can figure out a way to win at SMU it can be in great shape entering the Big Ten season. Derrick Walton: It was tough to watch Walton bury his face in a towel as he sat on the sideline with an injured ankle. He played a terrific first half, doing a good job of getting Michigan’s offense started when it sputtered early on. John Beilein says the ankle injury isn’t expected to be serious, but after last season’s nagging foot injuries ruined his season I’d guess the Wolverines will be cautious. Caris LeVert: LeVert has settled into a more natural play maker role over the last several games. He’s not dominating the ball by any stretch, but he’s got it when it matters most. He finished with 18 points on 4-of-10 shooting with nine defensive rebounds and seven assists. He’s turned into a bit of a closer as he’ll allow his teammates to play early in halves and serve as a closer late. He hit his second halftime buzzer beater in as many games and also made all 6 free throws to ice the game late. Duncan Robinson: Duncan Robinson posted an eFG% of 100% or higher for the third time this season. It’s not automatic when he shoots the three, but you can’t get much closer. Michigan will continue to find ways to get him involved offensively and I don’t see how you can’t get him more shots given his efficiency to date. His last two makes were a jab-step step-back three from the corner and a pump-fake one-dribble pull-up from 18-feet. Those are shots that he wouldn’t have thought about taking two or three weeks ago. Muhammad-Ali Abdur-Rahkman: I wrote at halftime that Abdur-Rahkman needs to be judged on his defense against Cat Barber in the second half rather than anything on the offensive end. He got the job done. Barber had only 6 second half points and four of them were after the game was nearly decided. Abdur-Rahkman also was able to break up two or three NC State fast breaks that appeared to be easy layups. With four points on four shots and four boards, Abdur-Rahkman finished with a team-high +27 in 25 minutes as he stepped up in place of injured Derrick Walton. Moritz Wagner: Wagner is going to be a special player. His sense around the basket and ability to finish (he had a ridiculous catch and finish in the first half) continues to shine, but he also had a nice fake dribble hand-off monster dunk. His motor and IQ will get him into trouble at times (he forced the issue a bit too much in the second half), but he just keeps playing and had a huge and-one finish off of a ball screen dish late in the second half to help ice the game. Ricky Doyle: Doyle had a few mind-bogglingly frustrating bobbles (3 turnovers) and drops around the basket, but he also had 6 points on 3-4 shooting, four defensive boards and a block in 16 minutes. He scored Michigan some big buckets (he seems to have a far better feel with Zak Irvin on the pick-and-roll than anyone else on the Michigan roster) and played some really solid defense inside against NC State’s bigs (Abu and Freeman were 0-9 from the floor). Zak Irvin: Irvin’s shot is still wild and erratic (he was 3-of-11), but he hit a huge shot down the stretch to push Michigan’s lead to 10 points and also had five rebounds and four assists. Irvin’s floor game is still there even if his jumper isn’t nearly up to form. Spike Albrecht: Albrecht checked into the game with Walton hurt despite the fact that he’s not practicing and he immediately threw an alley-oop to Caris LeVert. I thought Beilein might have stuck with him a bit too long as N.C. State started a run, but he gave Michigan five minutes off the bench it really needed. Aubrey Dawkins: Dawkins is at a crossroads as his backup (Robinson) can’t stop missing and he’s outplaying him on arguably both ends. Neither is a good defender, but Robinson is giving Michigan the shooting it needs. Dawkins had one mid-range make against the 2-3 zone, but was -8 in 15 minutes overall. Kameron Chatman: Chatman saw some first half playing time and had an assist and a deflection, but he was also whistled for 2 fouls in five minutes.